but I was immediately smitten. All of her hand painted canvases are gorgeous! She also makes handmade cards!!!! 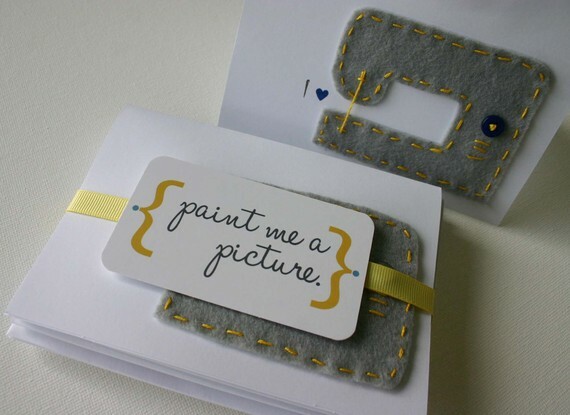 Paint Me a Picture is giving away a $15 shop credit! Visit Paint Me a Picture and leave a comment sharing the name of your favorite painting and where you'd hang it. i like the state love painings - I would choose michigan! I love the rain cloud painting! I would hange it in my closet! Oh my goodness her shop is adorable! I would for sure want to win the I Heart Photography in black and white! Love it! Ooooh, how cute! 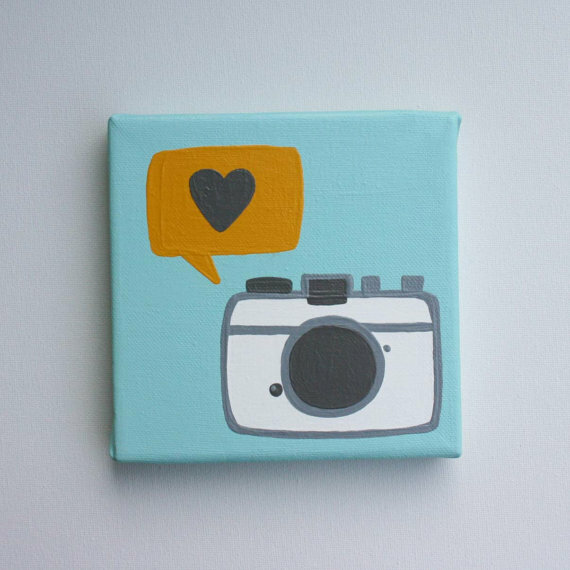 I really like the state love and I the I heart cameras! I think I'd put the state on my new mantel and the I heart camera, I think I'd hang in the office/craft room! 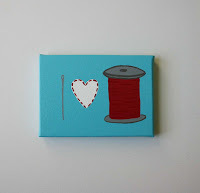 I would love to hang the spool thread painting in my sewing area! I love the rain cloud. The Rain Cloud one is adorable... it'd look soo cute in my bathroom! I love knitting is the one I would love, so cute!! And of course, it would go in my sewing/knitting/crafty room. I love the State Love, State Silhouette! I would chose something fun...maybe a green! I love the "Spool of thread, I heart sewing, I heart thread" painting. 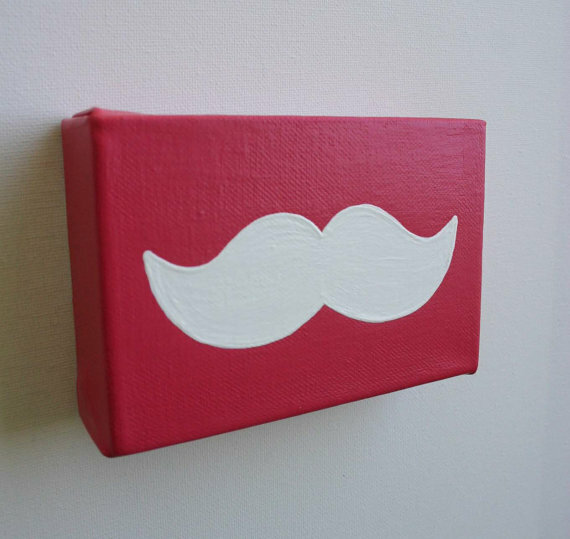 I would hang it in my craft room. I'm just getting into sewing, and this would definitely inspire me to just go for it!!! I "like" Paint Me a Picture on FB! The camera lamography. I LOVE photography and would hang it over the computer where I edit my photos! My favorite painting is the Affordable Original Painting Nursery Art, Kids Room, - Elephant and I'd want it in my office/craft area. I like the "I heart photography" black white and red painting. I want it for my house! I love her sew spool of thread pic. I would totally love a State Love painting of New York. Thanks so much for the chance. add your celebration button here"
Love the rain cloud--perfect for where I live :) And it would go in my craft corner. I love the LOVE with the spool of thread. That would go in my sewing room aka fancy dining room that we thought grown ups had to have....and has been used as a dining room less than 10 times in 8 years. Thank goodness. I can't decide which one I like more.... the spool of thread painting or the rain cloud. I love them both. Either one I would hang in my craft space. I now Like Paint me a picture on facebook! I love the dreamsicle mustache in aqua! I already "like" paint me a picture on FB! I can't decide between the Spool of Thread (which would go near my sewing machine, or course), and the State painting which would go in my hallway. I'd love a US map painting. I'd put a heart on each place we've been stationed and I'd display it in our living room! I like paint me a picture on FB! I love the USA Map for my sons room! !